Very much like the first 3 books in this series; the switch in authors is unnoticeable. Good story, good narator. 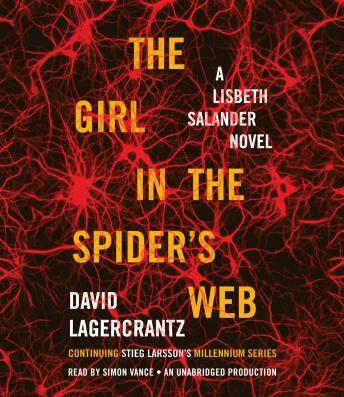 Lager leant does a great job continuing the Stief Larsen story capturing the characters Salander and Blomkvist and kept f their characters moving in a logical direction. A good plot line helped move the story along. I enjoyed it as I did the Karsen novels. Very good. Enjoyed listening. There were many characters and, at times, I got a little turned around. But it was easy to get back on track. We enjoyed this book while on a 20 hour car trip. This was my first time listening to an audio book. I think some books are better left in the print form. This one had many sub plots and many different characters. It was hard to keep it all straight. It would have made sense to have a narrator with a Swedish accent rather than a British one. I was excited to see a sequel to the trilogy and was not disappointed. I am pleased the ending lays the scene for yet another novel. I've not yet had my fill of Lisbeth! It was great to get to re-visit Steig Larsson's characters. Lagercrantz did a good job of weaving in the past history to remind us what had happened before, as well as bringing in the new characters and making us love/hate them. I'll look forward to the sequel that is surely coming. Can't imagine these stories being told by any other narrator. Really great audiobook. Not as good as the original trilogy, but I expected so much. Still fun.